For cancer patients, surviving everyday is nothing less than a battle. So when this client approached us with a cancer patient assistance program’s launch campaign brief; we knew it’s not just any other campaign that we do. Here we were not dealing with some product or service but a life support program. Right from nomenclature to service brochure all demanded a great amount of empathy while we communicate and at the same time clarity to avoid sounding over promising or providing any false hope. To name any cancer patient assistance program, the first few words which come to our minds are help, care, assistance, support, right guidance etc. One can notice most of the cancer support program named using these words. But doing what everyone else does it not Synapse’s style of ideation. We were not able to connect it to the company name as the client preferred to stay behind the curtain. We stumbled around numbers and figures too, but then we realised numbers make it sound detached on emotional level. We desired something out-of-the-box which will stand out from the crowd yet will not sound like some alien thing in cancer care. 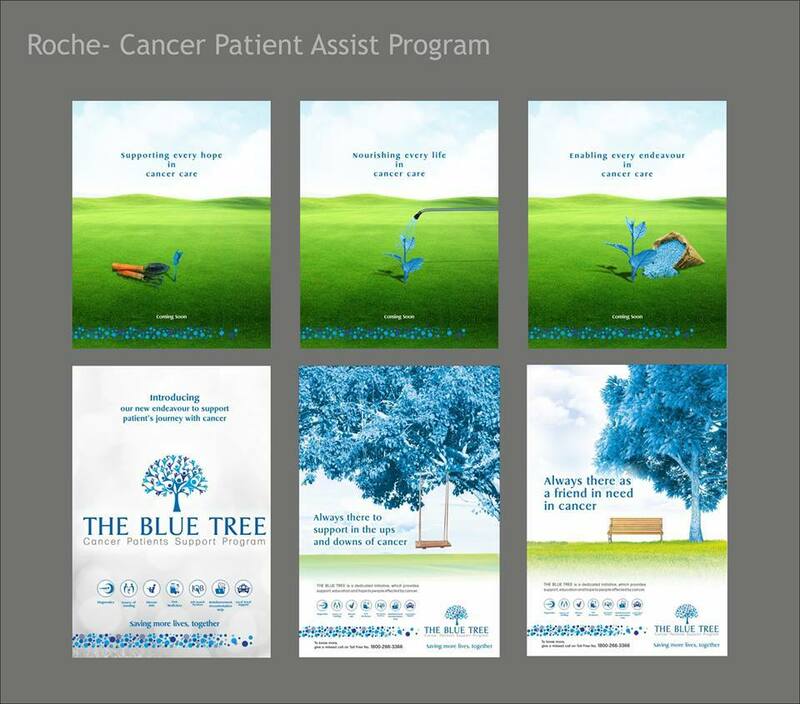 After a lot of brain storming finally we got it… THE BLUE TREE – These 3 words have so much more than just a name. Yes it has to be a tree. Since the beginning of time, trees have been providing necessities such as food, shelter, medicine and tools to mankind to bring a constructive change in lifestyle. Same way our program also aspires to bring a hopeful change in cancer patient’s life. We painted it blue but it was not just for the sake of being different or connecting it remotely with the company by using its logo colour. We chose blue as it projects trust, wisdom and stability in one’s life. Just what we thought was needed to assure the cancer patients with. We use human silhouettes, who are reaching out in all directions like tree branches to represent that the program offers services, support and information to the cancer patients and their caregivers. Teasers, revealer, posters and service brochure all revolved around the tree concept with fine art direction and precise copy. We thoughtfully used different stages of a tree’s life and various benefits that it offers; to project the program as a friend instead of a benefactor. With a few suggestion + addition + deletion + modification + everything else that can subtly represent the word ‘change’, from the Brand Manager’s side, we thought that we have done justice to the brief and now ready with our launch campaign. Only to realise that we have yet another hurdle to cross. It is the great ‘TM’ hurdle in every new brand’s life. Though, with our initial survey and net research we were sure of winning the trademark registration for the client. Yet we rolled our sleeves up and launched a full power research with a designated team to double check it for us. 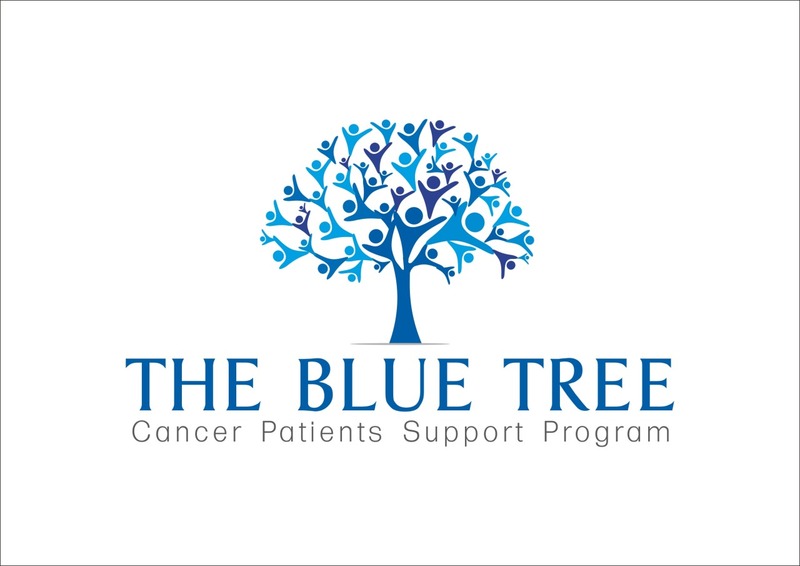 We were happy to know that THE BLUE TREE is a standalone concept in cancer care. We learned: Nature has a unique characteristic to inspire human life. A nature inspired communication is always soothing to eyes and has the power to accommodate the nuggets of information with an ease. It also allows to extend your communication with unlimited opportunities. Above all it has the potential to win a happy smiling face of your client for you. After being under the BLUE shadow for over a month, we are now infused with loads of renewed energy. We would definitely like to experiment and construct more campaigns around nature as core idea. We invite you to be part of the innovative journey of ideation with us.